‘Drink’ in the scenery and join us on our popular walking holiday in North Wales. 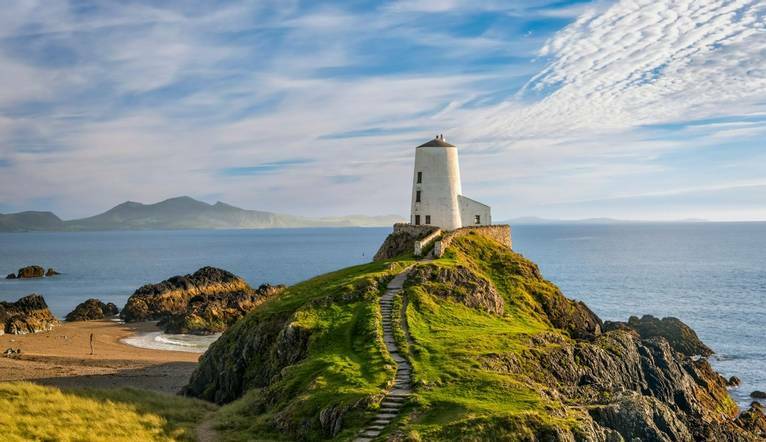 Our new walks over the weekend explore dunes and islands, history, valleys as well as ancient monuments, more than a taster of the Welsh countryside. Walking over the vast dunes of Newborough National Nature Reserve and onto the magnificent beach. Based in the coastal town of Caernarfon near to the picturesque Menai Strait, our historic hotel is just a 15 minute drive to Snowdonia National Park. Our walk today takes us across the Menai Suspension Bridge on to the Island of Anglesey. Walking over the vast dunes of Newborough National Nature Reserve and onto the magnificent beach. Take in some of the best views of the Snowdonia range and out across Caernarfon Bay. We continue on to the tiny island of Llanddwyn where celtic crosses, 13th century ruins and picturesque cottages are a photographers dream. Our return this afternoon takes us through forest so keep a look out for the elusive red squirrel. We set off from the mountain village of Capel Curig through pockets of sessile oak woodland onto the open moorland . The views on a clear day of the Snowdon Horseshoe are magnificent. A slow, but easy ascent along this ancient path brings us to the top of the pass looking down into the Crafnant valley and the shimmering LLyn Crafnant. Our descent to the Conwy valley takes us past the long since closed lead workings, heathery hill tops and historic monuments to legendary figures. Time permitting, we will make a visit to the medieval church, where Llywelyn the Great, Prince of Wales, worshipped in the 13th Century. Located in the heart of Caernarfon this marvellous hotel is just a 5 minute walk to historic Caernarfon Castle. The hotel can be found off Junction 10 of the A55. Complimentary car parking is available. Bangor station is approximately 9 miles away. Facilities on offer include a bar and lounge, restaurant serving locally sourced produce and a leisure club with indoor swimming pool, gym, sauna, Jacuzzi and steam room. The bright and comfy bedrooms all have TV, tea/coffee-making facilities, hairdryer and Wi-Fi. Two full day guided walks are included in the programme. The walking programme is graded easy to medium and you can expect to walk up to 12km on each walk. A coach will be used to transfer you to the starting/finishing points of the included walks. There is often confusion on the question of gratuities, since it frequently depends on the type of holiday, location and, of course, your attitude towards tipping, as to what is normally expected. In order to give you a rough idea, we have given appropriate guidance below. The Tour Leader will be on hand to offer advice or suggestions if required but gratuities are offered entirely at the sole discretion of the individual. We suggest a group collection at the beginning of your holiday to cover drivers, guides, porters and hotel staff (including restaurant, kitchen and reception staff) of approximately £8. Your Tour Leader will collect this on your behalf and distribute it accordingly, thus relieving you of the burden of who, when and how much to tip. The tipping of bar staff and housekeeping will be left to your individual discretion (the rounding up of the drinks bill and a small amount left in your room on departure should cover this and would be much appreciated). For any meals that are not included in your itinerary, restaurants expect a 10% gratuity (do check that service has not already been added to your bill). For taxis 10% of the metered fare.